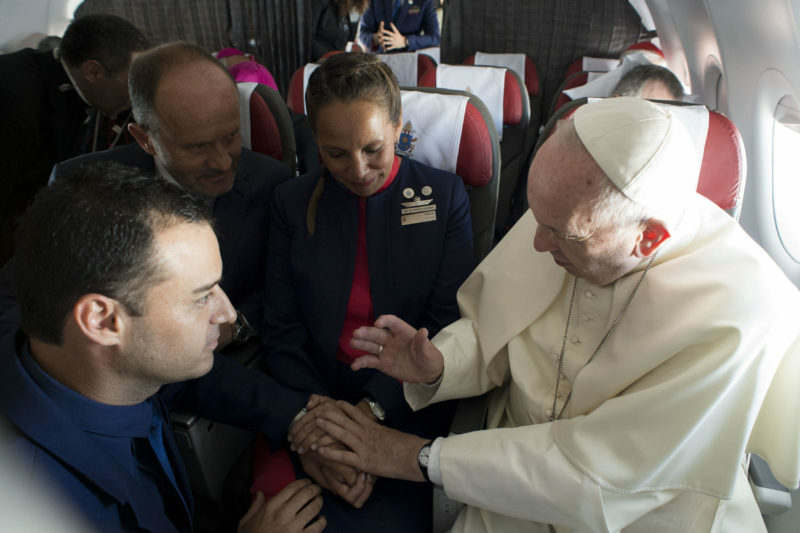 “They were prepared,” Pope Francis said, explaining the circumstances of the marriage of flight attendant Paula Podesta Ruiz, 39 and steward Carlos Ciuffardi Elorriaga, 41, on the occasion of the Pope’s press conference on the plane that brought him from Lima to Rome (January 21-22, 2018). The Holy Father blessed the couple’s sacramental marriage during the flight in Chile from Santiago to Iquique, on January 18, 2018. The spouses expressed their joy. “Our marriage will be very significant for all the couples in the world who have not married. It will encourage people to get married. We are of the diocese of heaven!”, they said. The Pontiff explained the circumstances to the journalists. “One of you said that I was crazy to do these things. But the matter is simple. The steward had been on the flight of the previous day, but she [Paula Podesta] wasn’t there. He spoke to me. And I also spoke of life, how I thought of life, and then of family life. We had such a conversation.